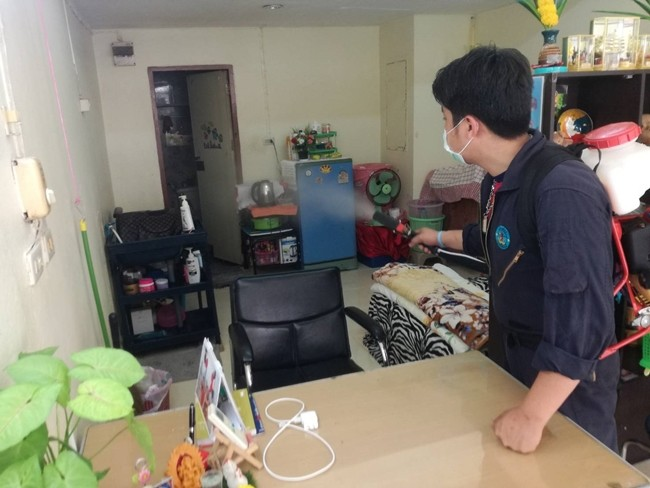 PATTAYA:--Pattaya public-health officers sprayed pesticide and educated Nirun Condo residents after a case of dengue fever was reported there. Technical officer Tapanee Srita along with Disease Control Department and public-health volunteers fumigated the condominium’s property and dropped abate into standing water to prevent mosquitoes from breeding. Officers distributed pamphlets and talked with residents about the perils of dengue and what can be done to prevent it, such as eliminating the watery breeding rounds where mosquitoes multiply. Health officers also advised people of the symptoms of dengue – chronic fever, nausea, red spots, bleeding and joint pain – and advised anyone experiencing such ailments to seek medical care immediately. Well the public health people should do something about the rubbish strewn vacant land to the east and clean it up and get rid of the soi mutts and rats as this is likely to more a cause than Nirun condos. Pattaya public-health officers sprayed pesticide and educated Nirun Condo residents after a case of dengue fever was reported there. This is called a shower, this other stuff is called soap! Zey ver only following orders ! As you say the rubbish dump is the more likely perfect breading ground for the mosquitoes. Years ago a friend was looking for a condo, he was taken by some agent on some viewings and I went along. Much to our amusement she took us to Nirun and remembering this experience vividly, I would say Dengue would be the least of the worries for a Public Health Worker visiting this hovel. It's obvious after reading replies to the, OP that none of them have a clue about dengue fever and even less about aedes aegypti mosquito. I have mentioned Nurin before. I think it could be the breeding ground for some type of epidemic. Rats and filth and mold and stench. I bet there are a lot of sick people there the aircon units full of filth and mold mostly have not been cleaned for many years. Nirun another gem in the city. I've not been but I'm told that is has improved a lot over the last couple of years. It's quite upmarket compared to where some of the locals live in and around town. Keha Theprasit, 9 Karat, and Flybird are some more gems. You know that you've really succeeded in life when you find yourself living in the Nirun Condo. Along with Firebird has some of the cheapest condos in Pattaya. Feast your eyes on some of these 800k seems closer to the mark.